In a landmark order Central Information Commission speaking through Commissioner M Sridhar Acharyulu directed the Bar Council of India to collect the copy of All India Bar Examination question papers with key for first three years from the Rainmaker firm which conducted examination, and keep the same on official website for the use of young lawyers. The Commission also asked the Bar Council of India to provide question paper along with the key on the official website immediately after completion of every Examination, which will avoid exploitation of young lawyers by the commercial elements through selling the question papers with key at exorbitant rates. The Commission directs the Bar Council of India to report the compliance within one month of the orders above. The appeal is disposed of. The complainant sought the copy of previous question papers prepared for the conduct of examination of All India Bar Examination I-VI. He relied on the earlier CIC order in Mr. G.Dones George Vs. Ministry of Law and Justice (CIC/SS/A/ 2013/000471,dated 5th Nov 2013) wherein CIC ordered Bar Council of India to provide the copies of question papers. The CPIO replied stating that the Bar Council has to take a policy decision on this and thus he could not furnish the information. He said the Bar Council has decided to provide the copies, and they were ready to furnish the same to the appellant. However they had copies of AIBE IV, V and VI only but not the earlier ones i.e., AIBE I, II, III, as those papers were not handed over to them by the Rainmakers firm who conducted examination. 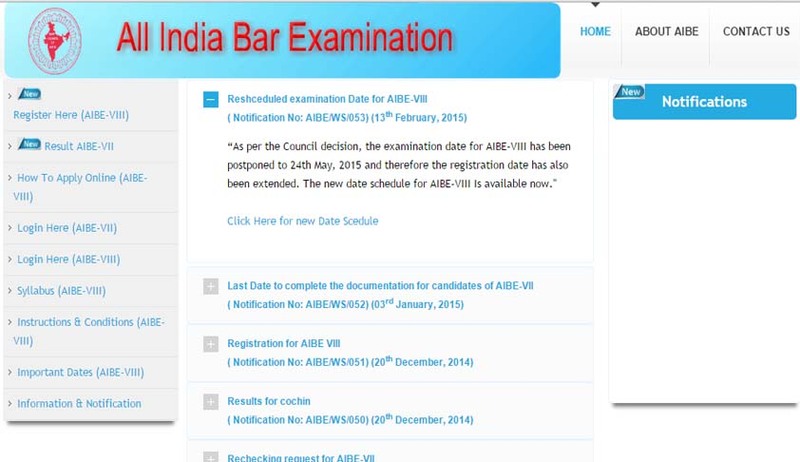 The All India bar Examination [AIBE] was introduced in the year 2010 by the Legal Education Committee of the Bar Council of India. The main object is to test Advocate’s ability to practice the profession in India. Upon successful conclusion of the AIBE, candidates are awarded a “Certificate of Practice. Qualifying the All India Bar Examination became a mandatory requirement to practice law for newly enrolled Advocates all over the nation. The All India Bar Examination [AIBE] contains 100 multiple-choice-questions [MCQs] and it is an ‘open book exam’. The Commission browsed the official website of the Bar Council of India and noticed that nowhere the copy of question paper of 2014 or earlier question papers and keys were made available. It is reported that around 27000 young advocates could not clear this qualifying examination. Every year law universities and law departments of other universities will be rolling out thousands of young law graduates, who are expected to take this mandatory examination. The Commission observes that it was not proper on the part of Bar Council of India for not providing the copies of AIBE I-III question papers on the excuse that they were not handed over by Rainmaker. It is the bounden duty of the Bar Council of India to make all the previous question papers available to the young lawyers. If the firm which conducted tests has not handed over the copies of examination papers, the Bar Council of India should have initiated legal action to recover them.